A few months ago there was a very worthwhile discussion at the Mobile Frame Hangar on the subject of articulation in mobile frame builds. I don’t just say that because I started the thread. The responses and discussion were very useful. A recent design by a very accomplished builder got me thinking about this subject again. 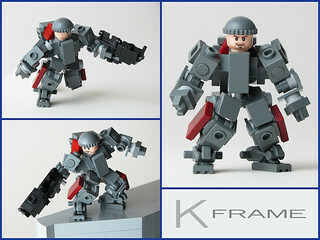 Now, this design by Brian Kescenovitz is a minifig scale hardsuit, rather than a mobile frame. However, take off the head and replace it with something more mecha-y and, et voila, you have a mobile frame. I think this is a wonderful bit of building: immensely poseable and full of character. The range of movement built into such a compact design is quite remarkable (look at the image at bottom left for a great example of dynamic posing.) There’s little that’s wrong with it. Or is there? This entry was posted in Building, Flickr, Opinion and tagged articulation, brian kescenovitz, flickr, frame, mobile frame zero on December 12, 2012 by Malcolm.